← Friendly Ghost What’s next for Bowie guitarist, Gerry Leonard? 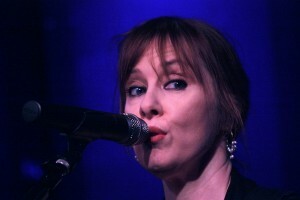 (HUDSON, N.Y.) – Suzanne Vega too often gets tagged with the Joni Mitchell brush, as do almost all post-Joni female, guitar-playing, poetic singer-songwriters. It’s unfair to them all but especially so to Vega, who only bears superficial similarities to Mitchell, and who over the course of her 30-year-career has certainly established her own voice and approach. That being said, there is another relevant comparison to a forebear that can be made, one that doesn’t take away any of Vega’s originality, but that helps to contextualize her work and might even enhance a listener’s appreciation of what it is she does, especially in light of live performances like the one at Club Helsinki Hudson on Saturday night. Vega is more the child of Lou Reed than of Joni Mitchell. Like Reed, who began his career laboring in a post-Brill Building-era song factory, Vega is as much a pop craftsman as she is a post-folkie. Like Reed, her songs – words and melodies – are heavily rhythm- and riff-based. Like Reed, she is a taut observer of urban street life – a street poet, really. Like Reed, she makes the most of her limited vocal instrument, having learned how to master it by punching out the notes and syllables with a minimum of sustain or melisma, turning those limitations into their own sort of art form. And as she showed at Helsinki, like Reed, she knows that the accompaniment of a skilled electric guitarist can provide enough ballast to turn what is otherwise ostensibly a solo performance into a full-fledged rock and pop show, which is what the audience was treated to on Saturday night. Vega was at her most engaging in the intimate setting at Helsinki, sharing anecdotes and observations that illuminated her compositions, or even poked fun at herself. She also offered a generous selection of her “greatest hits” such as they are, kicking off the show with “Marlene on the Wall,” “When Heroes Go Down,” “Small Blue Thing” and “Caramel,” as strong a four-song run as just about any singer-songwriter alive could offer, making at least one listener wonder why more people haven’t chosen to cover Vega’s compositions that connect the dots between Cole Porter, Burt Bacharach and the aforementioned Lou Reed. She displayed her versatility with quieter lyrical numbers like “Gypsy” – written, she told us, after a summer romance at a nearby Adirondack summer camp – and harder-rocking material, including “Blood Makes Noise,” a song about “fear and anxiety” through which accompanist Jerry Leonard spread Sonic Youth-style guitar noise, painting Vega’s theme in colors of guitar distortion. Vega premiered several new songs that suggested he hasn’t lost a step in the writing department; upon first hearing, “The Fool’s Complaint,” “I Never Wear White,” “Don’t Uncork What You Can’t Contain” and a number that she claimed was inspired by the Hudson River School of painters rank with Vega’s best material. Other favorites she offered were “Frank and Ava,” her recounting of the tempestuous love affair between Frank Sinatra and Ava Gardner, given a punk-rock treatment; “Left of Center,” also landing her squarely in New York City street-poet-rocker territory; “The Soldier and the Queen” and “The Man Who Played God,” another song inspired by an artist (in this case, Pablo Picasso). Vega concluded her main set with her greatest hit, “Luka,” and a version of “Tom’s Diner” inspired as much by DNA’s famous hip-hop remix version as by her original, with Leonard perfecting the vibe and with Vega busting some terrific dance moves. She took an audience request for “(I’ll Never Be) Your Maggie May,” a song that she was clearly unprepared to tackle. But she confessed that right up front, and a fan was right there at the moment she blanked on a lyric, and Vega caught it and ran with it, putting the perfect cap on a terrific show. This entry was posted in News, Press | Reviews, suzanne vega and tagged gerryleonard, suzannevega. Bookmark the permalink. also carry on this very good labor of love! !